William J Wilson, The Christian School in Secular Society, BOOK SUMMARY. In this world, according to Scripture, there are two distinct kingdoms. One is the Kingdom of Grace made up of "the people of the light" and the other is the Kingdom of Nature made up of "the people of this world." The Kingdom of Grace is an eternal kingdom with interests that transcend this world. The Kingdom of Nature focuses only on this world. Schools are powerful instruments that can be used to reflect the interests of either kingdom. 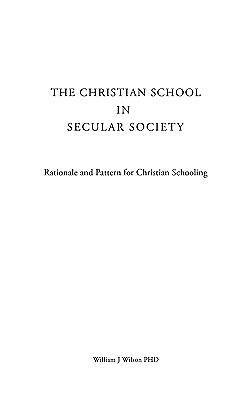 In a society that has become secularized there is an urgent need for Christians to increase their efforts to promote, establish and maintain schools that will accurately reflect who they are and where they are going. The Kingdom of Nature has taken full advantage of schools to promote humanistic naturalism. The Kingdom of Grace needs to take equal advantage of schools to promote a biblical understanding of life within the context of the highest spiritual and academic standards.